Adjusts vertically and swivels for uneven floors. These adjustable feet were exactly what I needed. Took the guess work out of leveling a table for my shop. Plus keeps the legs off of the floor. The screw may be worked by the foot since the foot does not freely rotate on its own. There is a 'nut' at the foot for wrenching if required. And the foot is slightly adjustable so that small surface changes still allow the foot to sit flat. 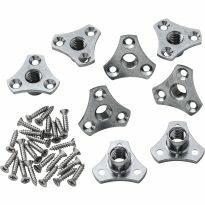 I used the supplied adapters but would recommend the T-nuts in end-grain soft wood or very long screws. Built a pallet bar. Installed leg equilizers on each corner. Balanced the bar as I hoped they would. Great buy. Looked long and hard,eliminated many other kinds of hardware. I have an ":old" Craftsman table saw that I installed some wooden blocks in the bottom corners of the leg stand. I drilled out a hole to receive the treaded part of the equalizer, attached this bracket to the wooden block, installed the treaded floor portion and with very little effort, I cranked each leg up or down until my saw was dead level. Just what I needed and wanted. Great! The equalizers are perfect for my requirements. They are well made and heavy duty. This leg leveler was exactly what I was looking for. I used it on the 4 corners of the Grandfather Clock I am building. It is very sturdy but small enough to be inconspicuous. It allows for minute adjustment necessary for the accurate operation of the clock. Once adjusted is very secure. I wanted to match the height of a separate woodworking bench to a built in bench to take advantage of the overall size of the combined benches. The height of the leveler with the mounting plate screwed down was a bit high so it was necessary to counterbore the bottom of the workbench to allow only 3/8" from the bottom of the bench to the bottom of the loveler ()about 1/4"). After that all was perfect and the job of leveling the bench was trivial. 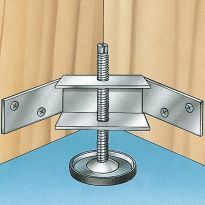 The only suggestion I would have for the levelers is that the top end of the screw be slotted so that they could be adjusted without lifting the bench. Well designed Good Quality Product Easy to install. Solid product well constructed. Wish it had non-mar surface on the feet. Used these on my outfeed table constucted of 4x4s and a 5x8 sheet if melamine. So it's a very heavy table. These were easy to install and adjust with only one wrench. Wish my table saw levelers worked the same way. Hmm.. Future project I think. made my piece of furniture to get the rigth adjustment on the stone floor and holding the extra weight of the metal Ping Pong table. Used these on a workbench that I use on an uneven floor. I had 10 tables to make out of repurposed wood(over 100 years) so was not all squared with the world. By using the leg leveles I was able to stabilize the tables. I hate sitting down at a table that wobbles back and forth. Have used this leg on several tables. It is easy to install, adjust, and provides a stable table surface! Had to make a new out feed table for my table saw, saw these before but never used them, bought a pair at Rockler for the 2 legs with the folding up hardware. These are built Strong and rugged, work as good as I hoped they would. I will be buying 4 for my 4' X 8' assembly table, these will take the weight of the table, like I said they are built extremely well and made to handle a lot of weight, im very happy with them. I added one of these units under my bed for extra support. Works very well. Solved my picnic table problem. Also very easy to install. These worked great and would recommend them, easy to install. I used these for a fairly heavy kitchen island table on a rather uneven floor. They worked great and have enough heft for heavier furniture. The price was fair and they were delivered quickly. I've purchased these several times as levelers for heavy furniture pieces and will continue to buy more! Easy to install, heavy duty, awesome. Just what I needed! I built a custom vanity for our bathroom remodel. The floor is slate, so the thickness varies from piece to piece. I wanted to be able to precisely level the cabinet, and this did the job beautifully.I did pick up item 26070 as well - a pack of t nuts in the appropriate size. They bite into the wood much better and make installation a breeze. Followed the recommendations of the other reviewers and bought 68387 at the same time. Works great. The levelers are exactly what I've been looking for! The old levelers were are lot more flimsy than the new ones and the table wasn't very steady. The new ones make the table really solid! It's a wooden leg table.I had to enlarge the old holes to make the new ones fit but it was an easy project. These levelers worked excellent. Because my floor isn't really level, it was easy to adjust and make my work bench sit like it should. I also ordered a heavier T-nut #68387 because of addition weight that my table carries. I used two of these in each of the five front legs that support a 2 foot by 24 foot glulam beam I turned on its side for a strong shop workbench (the rear and one end of the beam are supported by 2x6s that are bolted to the wall).The beam has several heavy tool boxes and other heavy shop equipment on it, so I used the #68387 teenuts which make the setup more robust. This arrangement made it really easy to level as well as support the beam. I have no issues with them, they worked as advertised. There are easy to move up or down, just make sure you get them in straight so the threads do not bind as you turn it in. I used these levelers on a large table and they worked great. Note that if the relief hole is not straight the leg will bind a little on the sides making it seem there is a problem with the threads. I constructed a 4x6 torsion box table for assembly work. It needs to be dead level but my floor has about 1.5&quot; slope over the diagonal of the table. 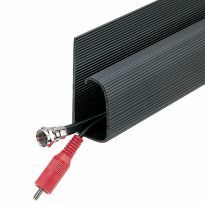 These in combination with screw-on teenuts worked great for that...easy to adjust from outside the base cabinet. Used these to level some basement shop tables on a not very level floor. I particularly liked the longer length of the bolts. They are sturdy, offer quite a range of height and prevented any kind of wobble due to the unevenness of the floor. Needed to make certain two tables used for toy train layouts were equal in height - product worked perfectly when installed on bottom of wooden legs (2&quot; by 2&quot;). I am in the midst of repairing 2 full size vintage pin ball machines and the leg levelors on the machines were all rusted. The leg levelors fit perfectly and look great.I have never had a problem with any order from Rockler and always get what was advertised. Rockler is the first place I go if I can't get a product locally which is often in our small town. Great quality product, easy to install, works as expected/advertised. Used in conjunction with part number 68387, screw-on tee nuts. Both parts fit together perfectly. Used both parts during fabrication of a (very large) Tiki bar, both parts can support a substantial weight. Would recommend and use again. They work nicely for shop furniture and have enough pad movement to adapt to uneven floors. They do need to have a straight perpendicular hole to go into to work at their best. This unit works very well and is sturdy. My only complaint is that it doesn't have a slot at the top for adjustment by screwdriver. I used these on the bottom of a cedar dining table, and they worked very well. The only change I made was to use longer screw to attach the base plate to the legs. 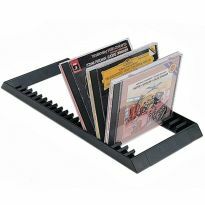 Good design, but they do not come with wood screws to attach the legs. If you don't have 16 of the correct wood screws, you'll be going to the hardware store. The combination leg equalizer installs easily and does the job of stabilizing any four corner cabinet or stand. However I found that the screw portion that you turn to raise or lower the leg stabilizer was tight and difficult to thread up and down. Of the four equalizers two where fine, one was moderately tight and one was excessively tight. It would have been nice if the bottom pad had a rubber cover to increase friction with the floor and minimize sliding. Read the reviews and you'll see these are great, as long as you get the t-nuts and ditch the&nbsp;plates they come with. I use them on the standing desks we sell. Easy to install, and I have no worries about weight capacity. The large feet look great on the desks too. If&nbsp;with&nbsp;the screw on T-nut standard with these, they'd be golden! 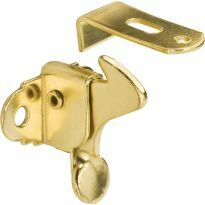 I used 8 of these with T-Nuts to level a stand for a 220 gallon aquarium. Including stand, tank, water, rock and gravel they are supporting a static load of about 3500 lbs. They have been in continuous use for 1 1/2 years and are still in excellent shape. The levelers work as advertised. I used a set for a (heavy) workbench. The included threaded T-nut is not as heavy-duty as I like, so I ordered a more robust option (Rockler #68387) that works well (and includes screws). Note that the screws securing T-nuts really serve almost no purpose in this case--they bear no weight--so screwing into end-grain is not a particular concern. I am building a rather large mahogany dining table, table top is 84&quot; long, 44&quot; wide and 2.75&quot; thick. The completed table weighs over 400 pounds and I needed a large heavy leveler and these fit the bill wonderfully. I especially like the screw on Tee-Nuts that came with them. Recommended by a youtuber who built this project that I am working on. My son is building a kitchen table. Using these for backup on uneven surfaces. Building a vanity and these equalizers work well. I'll be using this on my office furniture. They have the features and are the right size that we need to raise the height of some accent chairs for our dining room table. To make leg supports for a cast iron sink. To affix to 4x4" wooden legs on farmhouse table we are building for our outdoor deck. My Lazy boy style chairs lean back too far and I need to lengthen the back legs 1 1/2 inches to have my chairs sit more upright. I needed a heavy duty equalizer for a small kitchen table that has a heavy granite top. I have these on my kitchen island and they work perfectly. To be used in a self-designed portable plainer bench. I am building a new outfeed table for my table saw. building planting bench for sloping (slightly) surface. Great for leveling my shop made stands. I'm building a cabinet/router table and needed these for leveling. They have a good sized pad and are adjustable from the bottom. I have a non-standard application that I hope this works for. I need to have an adjustable table top height bench and this might work. These work well for uneven floors, have sufficient travel (for my applications...1-7/8"), and are easily adjusted from the bottom. I need a simple and robust leg leveler for a game table I'm building. Exactly what I needed for my bookcase. Building an outfeed table for saw and needed a way to level table. Sturdy, economical hardware for leveling children's workbench on paver patio. Whats the max height it goes? What size are the screes needed to hold the top plate on the end? There are four legs in a bag. The's are sold in a 4 pack. Wanting to order for a kitchen table that is sitting on an uneven floor. Do these have anything on the bottom of them to prevent a hardwood floor from being scratched? Thanks for the reply Dennis. Very helpful. there is nothing under , but i'm sure you can put the carpet felt under i put them on them and they hold very well. we slide the table and we had no problem. They do not have protection, but, they are extremely slippery so they do not scratch. Otherwise, peel and stick round wool pads work well on these. Thanks for the reply Leigh. No, the bottom is a flat metal pad. How much weight will each support? BEST ANSWER: i use them on a regulated size ping pong table made of wood and metal (over 400lbs)and they work perfectly we even push(slide) the table to see the strength , and they are very strong. Not sure of the upper limit, but I've used these under a large router table that weighs approximately 200 pounds. They are quite sturdy. I used them on a kitchen island table that will weigh well over 200 pounds when fully loaded. They are plenty hefty for this job. Is the threading course or fine? BEST ANSWER: The threads are coarse, 3/8 - 16. I suggest you use a Tee-nut, such as Rockler's 3/8 -16, rather than the base plate provided. 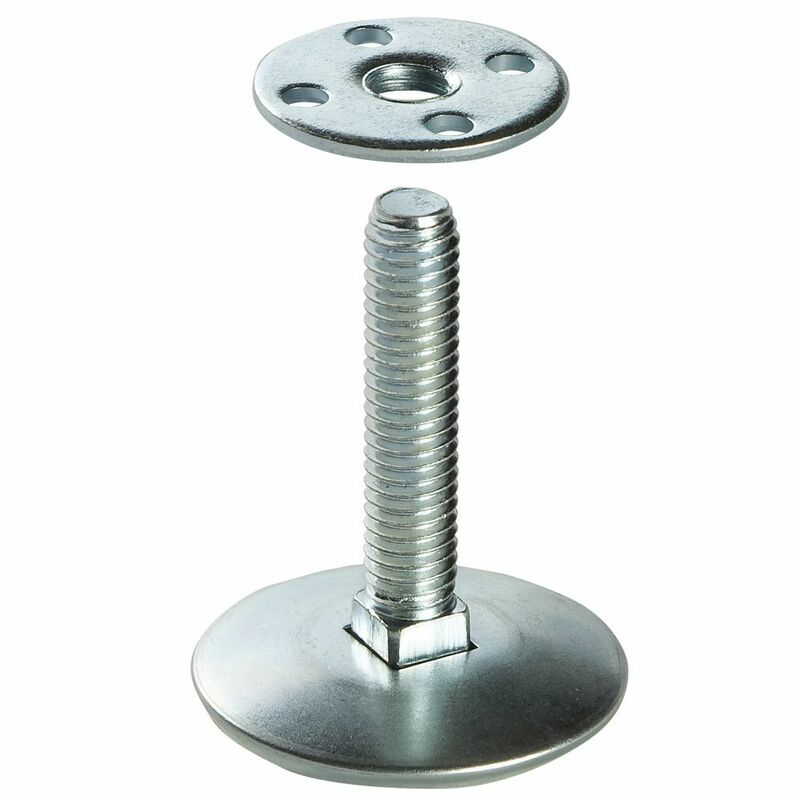 Using screws or nails to affix the base plate to a wooden leg only promotes splitting. In general terms it is course. These work great and I liked them because they are a lot longer than most equalizers. Are they good for outdoor application? Are these leveler good for a slate pool table? BEST ANSWER: This particular item would probably not meet the weight requirement for a slate pool table. 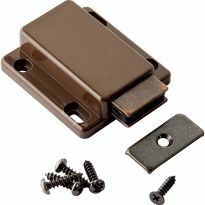 The stem and mounting plate threaded opening would probably have to be 1/2 inch or greater, preferably greater. Divide weight of pool table by 4 and check the weight handling specs of the equalizer you might choose. What weight table are these rated to support? BEST ANSWER: I made a large 8' curved desk which was later overlaid with acrylic laminate, it weighed approx 350 lbs. I used two of these levelers for the right and left side front support, they worked beautifully. I used larger levelers rated at 400 lbs for the 4 rear foot locations. I believe the actual rating is 150 lbs for these leg levelers. what is the diameter of the top plate? BEST ANSWER: The mounting plate diameter is 1-1/4" My previous answer was miss keyed. Is the threading (3/8-16)Coarse or fine? Needing leveler so for a stand that will support front load washer/dryer set. Will this support? BEST ANSWER: If it accepts a 3/8" -16 thread then this could be considered.